Michael talks a little about his country, Australia and about its cities. Todd: We're going to talk about Australia. Or your going to talk about Australia. So first of all how many people live in Australia? Michael: Australia? Oh, there's about 20 million people in Australia right now. A little bit under but close to twenty. Todd: OK. What are the biggest cities? Michael: The biggest city? The biggest city is Sydney. Then it's followed by Melbourne and then Brisbane and then I think it's Perth. Most of the big cities are on the East Coast of Australia. Perth is on the west coast but sort of of out there by itself. Todd: OK. If you had to live in one place where would you live? Michael: I like Brisbane. I had my teenage years in Brisbane, growing up in Brisbane. 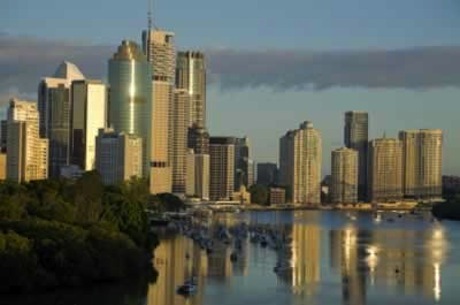 Maybe Sidney because it is a big city, but Brisbane has got the gold coast and the sunshine. Todd: Oh, nice. Actually, what is the capital city of Australia? Michael: Ah, Canberra is the capital city but it's not the biggest city. Sydney is the biggest city. Canberra was made sort of by the politicians so Sydney wouldn't get too crowded. It's a separate territory. Todd: Have you been to all the major cities in Australia? Michael: I have been to Melbourne when I was young. Yeah, I have. Only a short time in Perth. Todd: OK. What is the best thing about Australia? Michael: The best thing about Australia? Ah, probably the friendly people. The relaxed attitude and we like visitors from other cultures. Todd: Oh, cool. How are Australians different than other people? How are they unique? Michael: How are Australians unique? I would say that we're more fun-loving maybe or accepting of other people. We don't mind making new friends actually and conversing with other people. Todd: Yeah, that's good. That's nice. OK. Thanks a lot Micheal. There's about 20 million - a little bit under, but close to 20. There are just under one million people living here. It's close to nine hours by bus to get there. Do you live near the capital? The President lives in the capital city. The politicians didn't want Sydney to get too crowded. This town gets really crowded during the summer. The gym gets crowded after 5 o'clock. He is a fun-loving person, but he can be serious too. My grandparents aren't the most accepting people. We don't mind making new friends and conversing with other people. She doesn't mind traveling by train. I don't mind pizza, but I prefer pasta. Jessica talks about her mom and dad. Matts explains his special relationship with dogs. Steven talks about a picture of a big red bus. Kerri shares her recipe for a delicious omelet. The bar usually isn't this . How far are you from the city? They are of people from all over the world. He must be seventy years old now. It's good to be , but sometimes you need to focus.